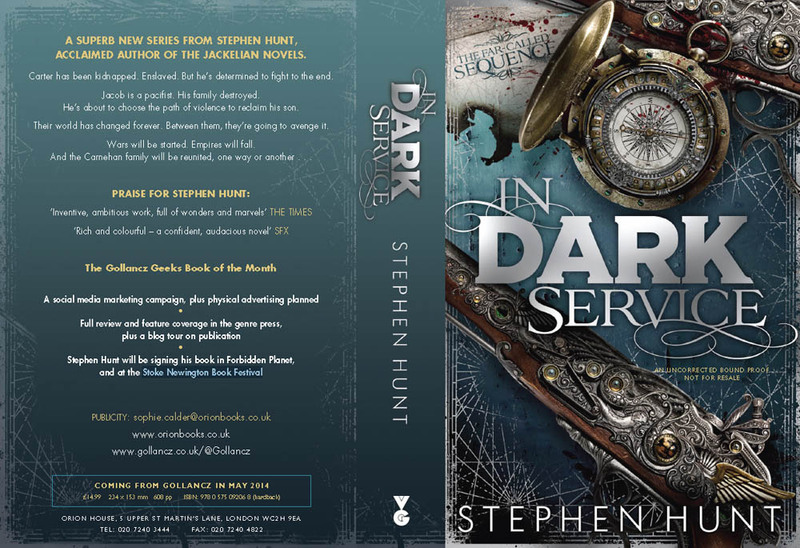 The bound proofs will be going out for In Dark Service very early next year (2014) to reviewers in the media, prior to the book’s official March 20th 2014 publication date. There’s a cover shot below – subject to change (these things are always tweaked). This is a new fantasy series set in a distinctly non-Jackelian world. Are you excited? I am! The jacket copy currently reads . . .
Jacob Carnehan has settled down. He’s living a comfortable, quiet life, obeying the law and minding his own business while raising his son Carter … on those occasions when he isn’t having to bail him out of one scrape or another. His days of adventure are – thankfully – long behind him. Carter Carnehan is going out of his mind with boredom. He’s bored by his humdrum life, frustrated that his father won’t live a little, and longs for the bright lights and excitement of anywhere-but-here. He’s longing for an opportunity to escape, and test himself against whatever the world has to offer. Carter is going to get his opportunity. He’s caught up in a village fight, kidnapped by slavers and, before he knows it, is swept to another land. A lowly slave, surrounded by technology he doesn’t understand, his wish has come true: it’s him vs. the world. He can try to escape, he can try to lead his fellow slaves, or he can accept the inevitable and try to make the most of the short, brutal existence remaining to him. … unless Jacob gets to him first and, no matter the odds, he intends to. No one kidnaps his son and gets away with it – and if it come to it, he’ll force Kings to help him on his way, he’ll fight, steal, blackmail and betray his friends in the name of bringing Carter home. In Dark Service bound proof copy (click to see full size). « Jack Cloudie… airship hunting.